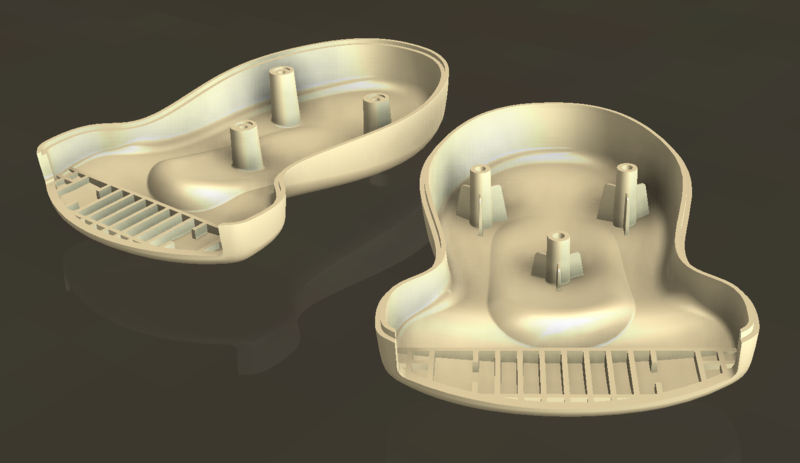 Continuing on with part 3 of our blog series dedicated to showing the differences between Autodesk Inventor Professional 2011 and SolidWorks Premium 2011 for digital prototyping workflows, we examine the ability to design and validate molds, starting with a pre-designed part. 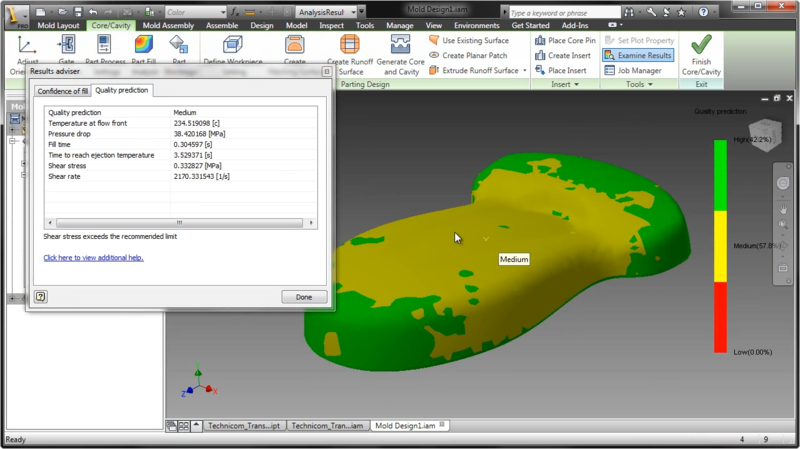 We show below, using videos from both systems,three major design aspects of mold design: the ability to use a 3D model of a plastic part to create the core and cavity of the mold, designing and engineering the multiple components and systems of the mold, and validating the design to ensure it can manufacture high-quality plastic parts. Autodesk provided us with a model of the handle to be molded, detailed specifications for the mold, and three videos of Inventor performing the desired tests showing the workflow for splitting core and cavity, engineering of the mold, and a simulation and validation of the mold. Autodesk Inventor provides standard libraries of mold bases and components along with automated tools for splitting the core and cavity and for designing the runners, gates, and cooling and ejection systems. The inclusion of Autodesk Moldflow simulation software directly in the design workflow allows designs to be validated and improved upon until they will optimally manufacture products of the highest quality. SolidWorks includes dedicated functionality for splitting the core and cavity, but that is where the mold design capabilities end. With no automated design tools and no libraries of components, the design of injection molds is entirely manual and inefficient. 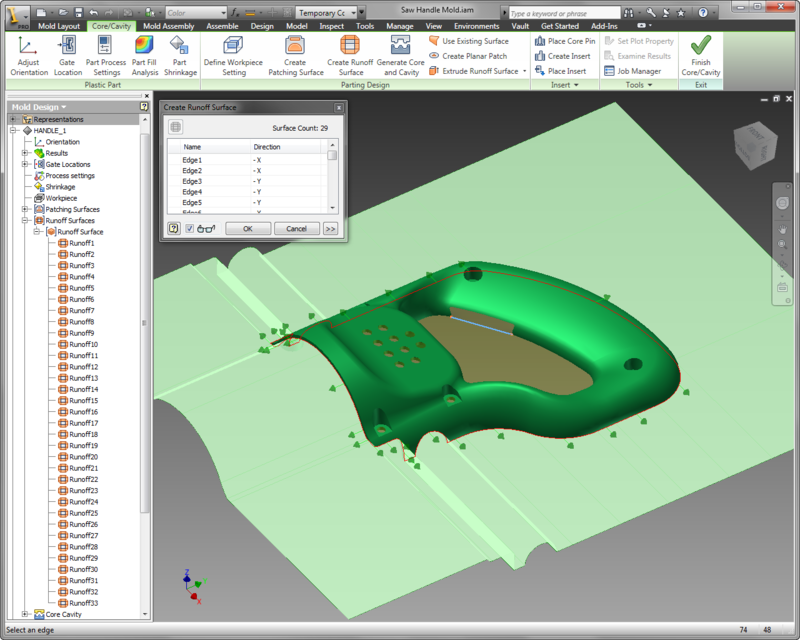 Without any built-in plastics simulation capabilities, mold designers must purchase third party software, such as Autodesk Moldflow, often at significant cost, to validate and optimize their designs to ensure quality. Balance of speed in designing the mold while ensuring high quality. Accurate design of mold components including runners for injecting the plastic materials, cooling of the mold, and ejecting the finished part. Iteration of the mold design with simulation to arrive at an optimal design. 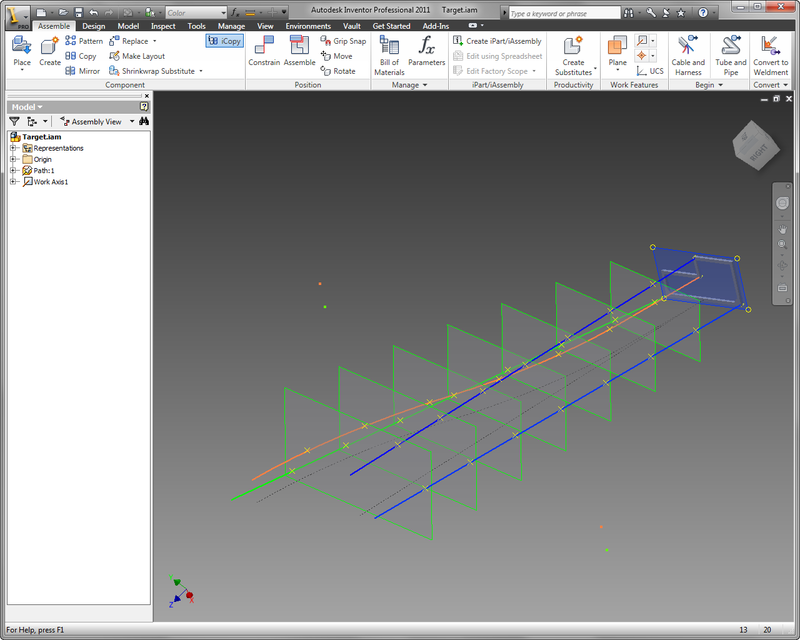 The desired result was to generate parting surfaces and complete the core and cavity operations. Inventor used a mixture of automated and manual patching and runoff surface creation tools. Surfaces for simple holes and profiles were created automatically which increases productivity. Complex patching and runoffs were created using Inventor’s surfacing tools. SolidWorks also assisted the user in splitting the core and cavity with automated and manual tools for defining the parting line and creating patching and runoff surfaces. The two systems are comparable in capability. 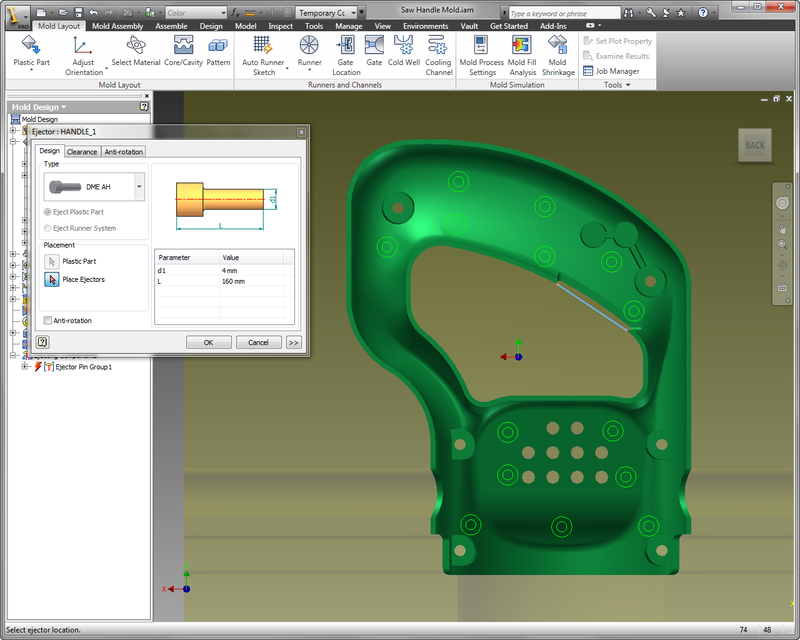 SolidWorks required a few more menu picks and interactions, but both came up with an acceptable mold core and cavity. SolidWorks generated an odd triangular shape in the area to be removed, but it was temporary and did not affect the final part. The tasks completed included: designing the runners, adding a submarine gate, inserting a properly sized mold base, inserting a sprue bushing, designing cooling channels, attaching pipe fittings for cooling channels, and adding ejector pins as specified. Inventor completed this task using a built-in workflow for designing injection molds that includes libraries of mold bases and standard components as well as automated design tools for runners, gates, cooling channels, slides, lifters, and ejectors. SolidWorks had no built-in functionality for designing injection molds. All standard components needed to be searched for and brought in from external content centers or supplier websites, a time-consuming process. All modeling was done manually as there are no automated design tools for the various systems of the mold. This made mold design in SolidWorks a tedious and labor-intensive process with low user productivity. SolidWorks was able to build the geometry required for the moldbase design, but it was a laborious process. 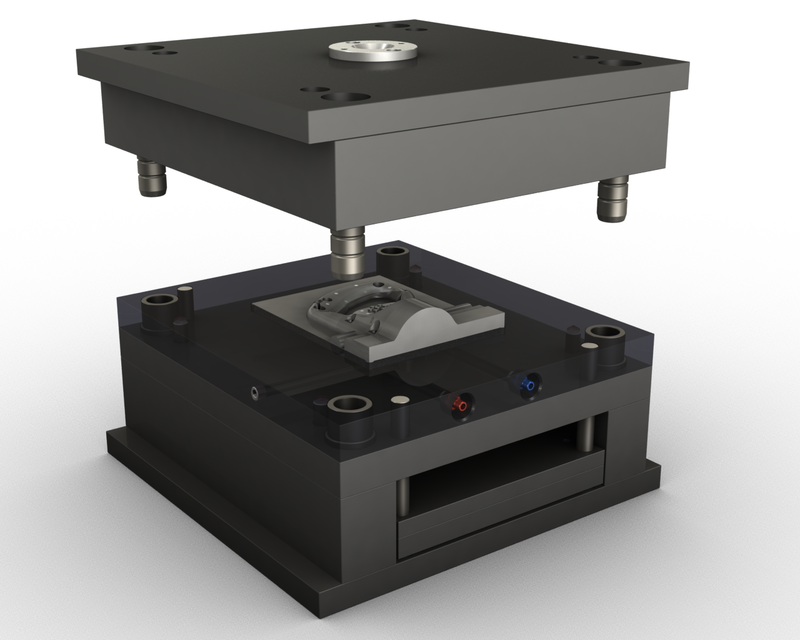 To validate the mold design for manufacturability we needed to first determine the optimal molding conditions for the entire system as designed. Next, we performed a filling analysis to determine if the mold, as designed, could completely fill the cavity at acceptable quality. Then, we assessed the location of air traps and weld lines. Lastly, we performed a shrinkage analysis so exact figures could be input for core and cavity sizing rather than manually inputting generic percentages. Inventor includes Autodesk Moldflow simulation built-in to the mold design workflow, which was used to simulate the filling phase of multi-cavity molds and their respective runner systems to validate manufacturability. A shrinkage analysis was also used to ensure cavities were sized based on the specific design, rather than relying on generic shrinkage factors from the material supplier. Inventor validates the mold design. SolidWorks has no built-in simulation capabilities and therefore had no ability to validate the mold design for optimum molding conditions or for a filling analysis that would help the user avoid manufacturing problems that can potentially result in huge expenses in both time and cost. SolidWorks was unable to perform any portion of this validation using its software or no-charge software, of which there was none available that we were able to find. Users could use Autodesk Moldflow stand-alone software that would have the capabilities required, at extra cost. Our analysis did not include examining extra cost third party products. We only compared Inventor Professional to SolidWorks Premium. 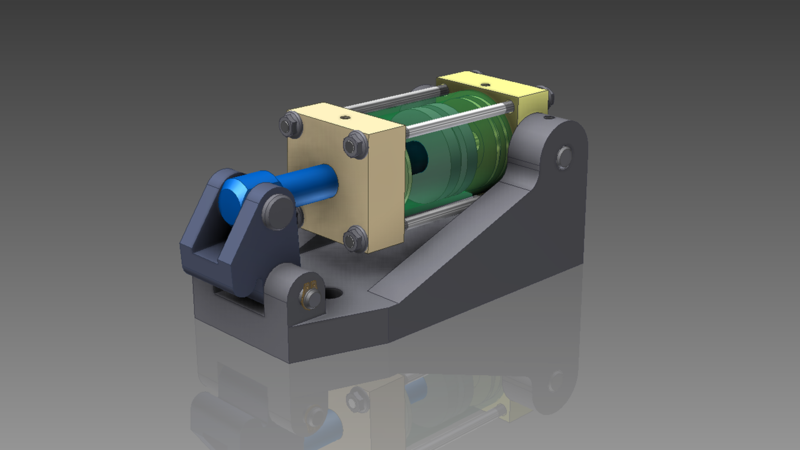 Therefore we do not have a video of SolidWorks performing the mold validation. The next blog in this series (Part 4) will examine designing and analyzing a clevis pin in a hydraulic clamping assembly. Stay tuned or sign up to be notified of my blog updates. Plastic Part Design tests the ability to import surface data from Alias, stitch the skins into a solid body, design the shell the part with a specified wall thickness, part using surfacing and plastic features, import new surfaces and update the model, and perform an injection molding simulation on the part. Autodesk provided us with data files specifying the solid model, IGES and WIRE data files of the surfaces, and three movies depicting the workflow for surface import, engineering design, and simulation and validation. Inventor was able to import the Alias wire file natively without issue. SolidWorks was unable to import the Alias wire file. Users must first translate Alias data to an IGES file, which is susceptible to translation errors, albeit not in this case. Creating a solid model from imported surfaces and being able to shell the resulting solid are typically the most error-prone steps in the process. Inventor was able to stitch and shell the part with zero errors. The shell was created in one step by defining the variable in the shell dialog box. SolidWorks was also able to stitch and shell the part with zero errors. Shell creation involved several steps to create and define the variable. Plastic parts are typically designed using a set of standard features such as ribs, bosses, grilles, snap-fits, and lips to name just a few. 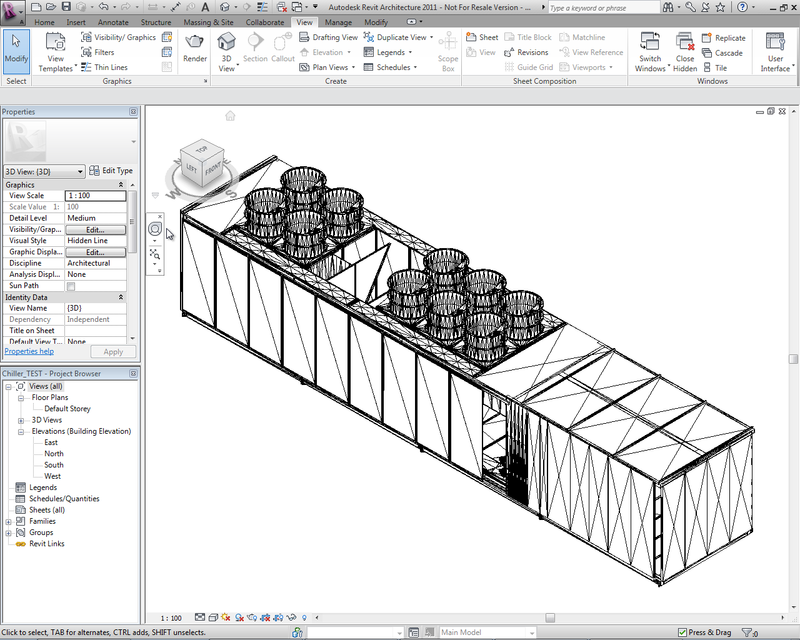 The MCAD software should assist the user in efficiently modeling these features. Inventor used its plastic features toolset to add the two different types of bosses, a lip feature, and ribs. SolidWorks used plastic features for a majority of the features, although the recessed bosses required for this test first needed to be built manually and then added from the library of custom user features. Plastic parts must be checked for potential quality defects prior to committing to the cost of designing and building the mold. In the simulation to evaluate the manufactured quality of the product as-designed, Inventor simulated the injection molding process and uncovered high amounts of shear stress due to the part being too thin. If left uncorrected, this issue would lead to material degradation and molding defects or field failure. 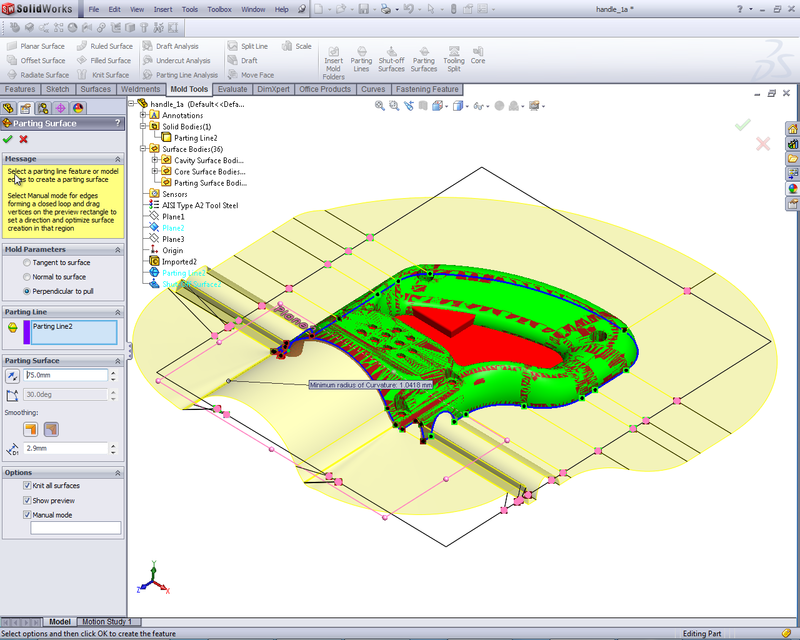 Inventor’s built-in mold analysis software also provided more extensive capabilities in terms of material selection and multiple gate analysis. There are no built-in simulation capabilities within SolidWorks for evaluating the manufactured quality of the product as designed. However, we were able to use a third partner add-in module called SimpoeXpress. This has limited function, but allows for some material selection and a single gate. SolidWorks was able to simulate the molding process but the only result the user received was the filling pattern, which provided limited value. It was unable to identify any quality defects and the user was misled into thinking the design was acceptable. More comprehensive simulation packages are available at a cost of more than $5000. 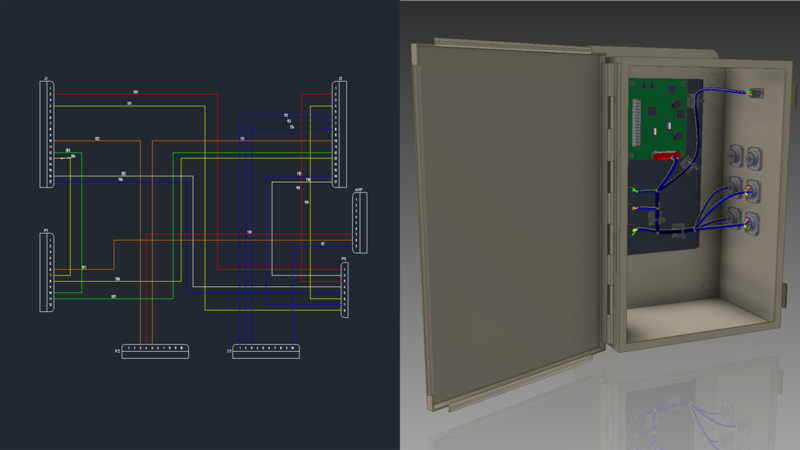 After modifying the 3D CAD model, we reran the simulation to validate the design change. 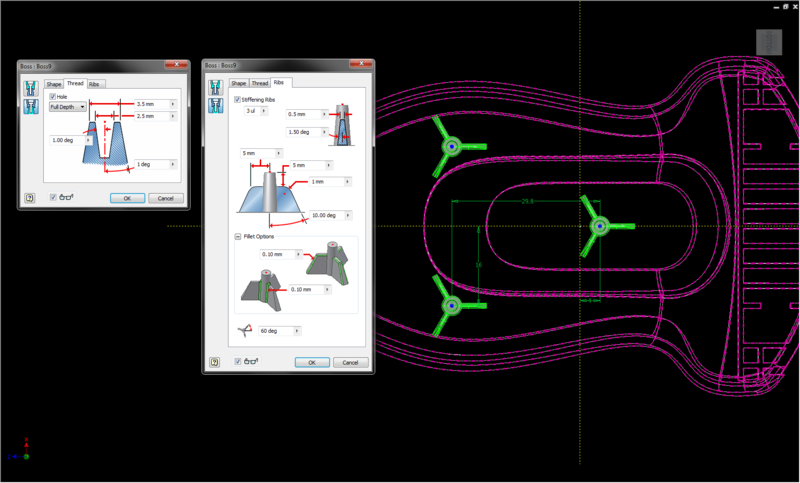 After making the recommended change to the part, Inventor automatically updated the model in the simulation environment; all that was required was to re-run the analysis. 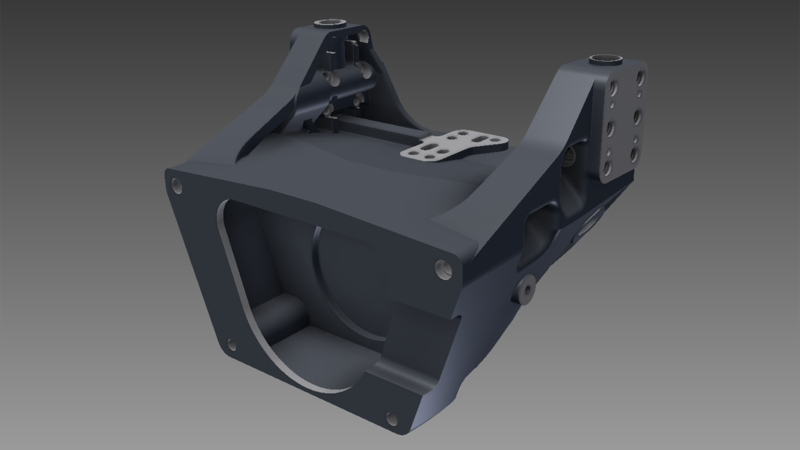 SolidWorks automatically updated the geometry but the analysis had to be setup from scratch, including processing parameters, gate location, and material selection. Importing the IGES files and creating the plastic part was comparable for both products. 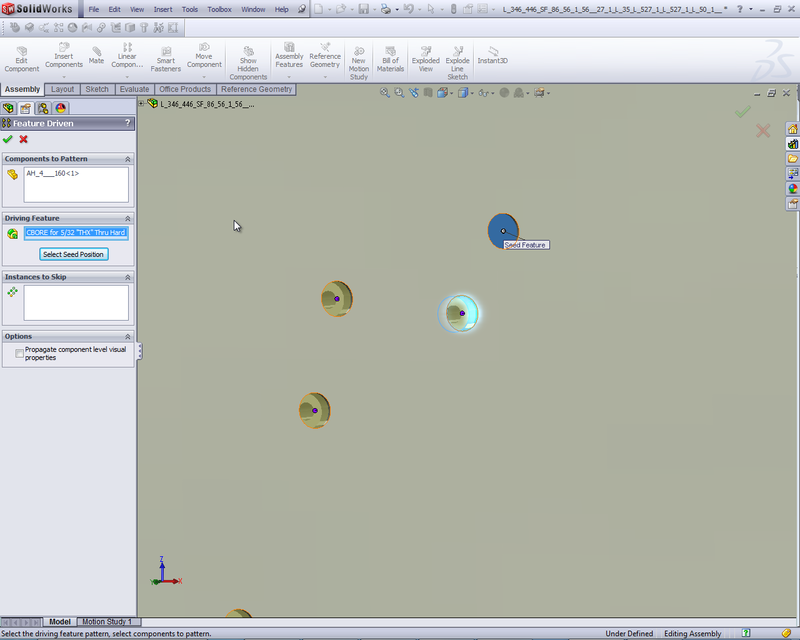 While SolidWorks was able to import IGES curves from industrial design software, Inventor was able to directly read Alias (a leading industrial design software package) surface data, an advantage. Both products had excellent capabilities for building specialized plastic features such as the mounting boss and the lip and groove on the connecting halves of the model. Inventor’s built-in analysis software powered by Moldflow provides impressive analysis capabilities, and is well integrated into part design. To perform these same tests with SolidWorks, on the other hand, required a no-charge third party product that was able to perform only a limited analysis of the part. The limited function mold analysis software that was free does not provide the engineer enough insight to be confident that parts can be manufactured at all or at acceptable quality. 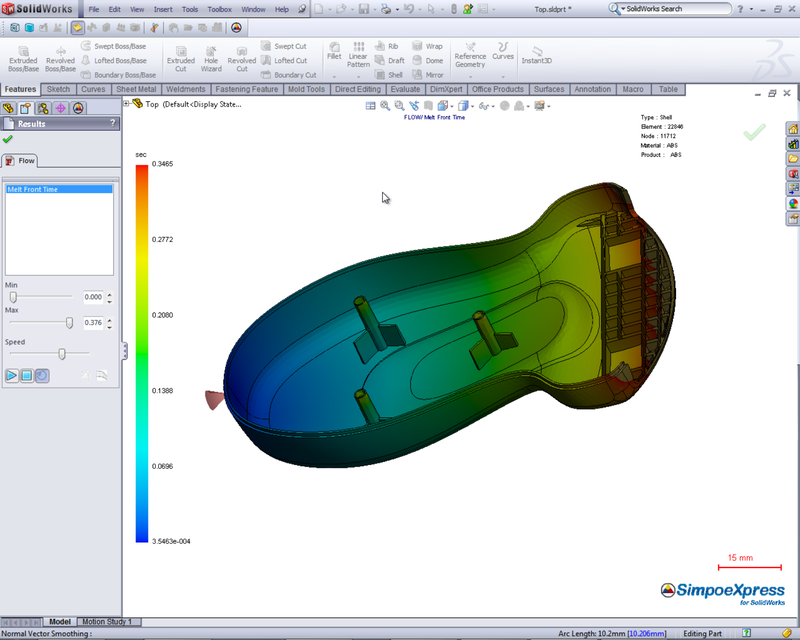 More complex mold analysis software with advanced analysis capabilities (which was not used) is available to SolidWorks users at considerable extra cost. What a shocker! The premier 3D MCAD software organization, Dassault Systemes, announced a pure 2D drafting product with the business side based on an open source software model that provides free software. 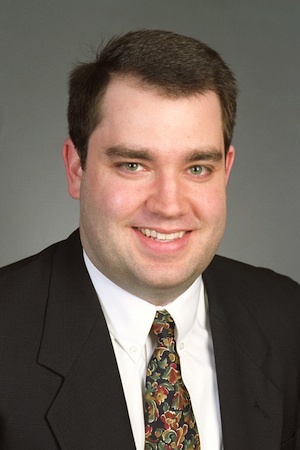 To find out more about the why’s and wherefore’s, Ray contacted Aaron Kelly, the head of this new business unit. My explanatory comments are within the brackets  . Where does the DraftSight organization fit within the DS and SW company structure? Is DraftSight a stand-alone company? How big is it? How is it organized? The DraftSight organization has its own P&L and is made up of DS employees around the world. The team is made up of about 24 people in training, customer support, technical support, development, QA, marketing, product marketing, and sales. What is the sales model, considering that the product is free? The primary target customers are existing DS customers who have a need to work with 2D and DWG files. This is a need, up until now, we have not had a solution for. What is the cost/benefit to proposed customers? We are trying to make is easier for our customers to invest in 3D and related technologies. By offering a low to no cost 2D offering, our customers can invest money allocated for 2D and use it to invest in 3D. The important thing we are trying to achieve is a superior user experience. It starts with an easy to download, free to activate product, shaped by a free, vibrant community, and is rounded out by professional technical support options. Is the DraftSight product meant to completely replace 2D software from other competitors? No, not really. Many of our customers today use DS products and our competitor’s [2D] products side by side. We are happy we are solving our customer’s needs where we can. We want the opportunity to either offer new 2D to 3D users who need it, expand the usage of 2D to those users who need it, but maybe cannot afford it, or replace competitor’s 2D software wherever a customer sees value. How does DraftSight interface with other DS products? With non-DS products? Many products from 3D CAD (SolidWorks and CATIA) to PLM products from DS read DWG files that DraftSight uses. A focus on 2D is new for DS. Why now and what’s to come? Where does the underlying technology come from? Is it Graebert? What is the impact of the Ares announcement on DraftSight? We have a partnership with Graebert to use the ARES platform with DraftSight. We are in a very close partnership with Graebert and endorse their products for sale that have a different value proposition from DraftSight. For example, ARES Commander has a richer API and 3D as well as other features that DraftSight does not include. What is the product future of DraftSight? DraftSight is in Public Beta today. We will be shipping a released product in the coming months as well as a Beta version of a MAC release and a Linux release. Each DraftSight version was written specifically for the platform intended – either Windows, Mac or Linux. Why is this different than other free CAD products that have failed to be successful? Customers are looking for more than free software. They want a real product with a future from a solid company, along with a long-term commitment, performance, multi-language offerings, and global support. We are offering this. Is it open source? How do third party developers work with it? What are the support plans? We have free community support for all users. Users have the ability to post questions to the entire community for feedback. We also have a support offering today that will enable a user to call, e-mail or even request remote access when applicable to help them out. For more information about DraftSight go to www.draftsight.com . 10 Aug 2010: Yesterday I published a TechniCom Group whitepaper comparing Autodesk Inventor 2011 versus SolidWorks Premium 2010 to www.cad-portal.com. I suggest you read it carefully. The methodology used was a new research technology we have been exploring that uses our variation of the Delphi Expert Analysis. This technique has primarily been used in the past to survey experts, the aim being to predict the future. TechniCom adopted it to provide clarity in comparing complex systems such as CAD and PLM. We have also used a similar method to successfully analyze gaps in program plans that might reveal competitive opportunities. This paper was not our original goal for this study. Rather, we were investigating the competitive positioning of Inventor’s upcoming (at that time) 2011 release as an internal project for Autodesk. Autodesk was particularly interested in exploring the fifteen functional areas shown in the paper, since they felt these were their strong points. Originally we proposed 24 Functional areas. I will share some of these additional areas with you below. Some of these, no doubt, would have shown SolidWorks scoring ahead of Inventor. In any case, after the results of the expert scores were “normalized” and tallied we were surprised at the results; Autodesk also seemed surprised, but elated. Autodesk asked us to summarize and publish the results. We hesitated, but willing to stand by the results, agreed to write the whitepaper. Some independent comments on the web have called the report worthless. We could not disagree more. Take it for what it is – the subjective opinions of a limited number of experts familiar with the software. Several of the categories were so close that the voting could have easily gone either way. Even more important, are that most scores of both vendors are well below the top score of 5. Reviewing these gaps shows that both of these leading vendors still have far to go before they are perfect. The study was not asking whether each system could perform BIM — rather the seven questions we asked the experts were focused on the interaction between a mechanical system and BIM. In essence, could mechanical parts be designed for use within a BIM system? Areas of focus included: managing the space requirements for the mechanical design within the building model, bi-directional data transfer, associative data management, and UI issues. How to compare complex systems is always a challenge. Recently TechniCom has been using a technique called Delphi Expert Analysis. The idea being that asking a question of an experienced user should result in a cogent response of how well he perceives a system performs a specific task. The results depend on asking the proper questions, selecting truly expert users, and managing the process. Our experience using TechniCom’s Delphi Expert Analysis shows that this is a solid way to perform market research on technical software. Instead of a simple feature and function analysis, the Delphi expert approach relies on the opinions of independent external expert users who rate and comment on a series of questions prepared by TechniCom. Developing the most appropriate questions ensures that our analysis is correct. We recruit a number of experts for each system being evaluated. Ideally each group of experts has correspondingly similar backgrounds. We provide a series of detailed questions to each expert, closely monitoring their progress and working with them to insure similar levels of evaluation to those of the other experts. The detailed questions are each rated subjectively for each system along with each expert providing comment that justifies each rating. For instance, if the expert rated that the question scored a 2, then the comment explains why. The scores range from 0 to 5, with 5 being the best, and 0 depicting no capability. A rating of 5 could be considered perfect — the question being evaluated meets all requirements and can expand to meet future needs. Very few 5’s are awarded. Out of range ratings are explored individually with the expert. Each expert gets a final pass at their evaluation after receiving a report showing the results of their peers. This proves highly effective in normalizing the results. We then accumulate all answers and summarize the results. On Monday, 9 Aug 2010, a summary of our most recent analysis using this technique to compare Autodesk Inventor and SolidWorks will be posted to http://www.cad-portal.com .